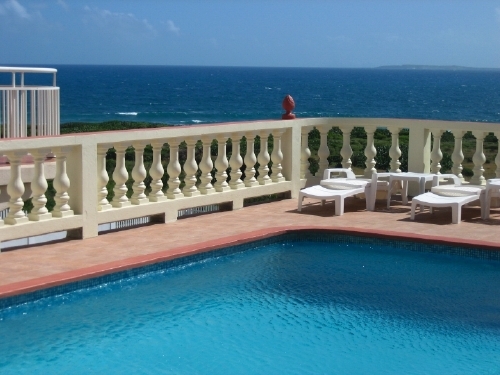 Ocean Terrace is an intimate private residence club, consisting of eleven one and two bedroom luxury condominiums, nestled on a hill overlooking the Caribbean on the southeastern shore of the beautiful island of Anguilla, BWI. 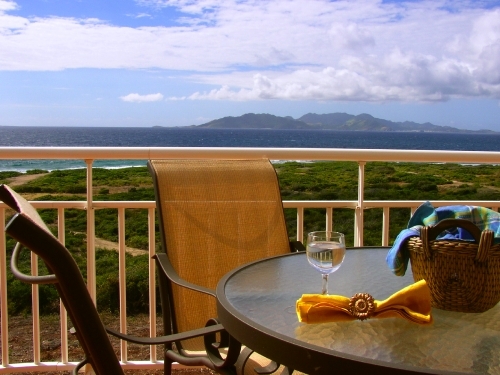 Condominium units are available for purchase in monthly fractional shares or for vacation rentals. The spacious condos range in size from 1,100 – 1,500 square feet; each unit is beautifully styled and fully furnished with gracious appointments and luxurious details. The condos all come with a fully equipped gourmet kitchen, spacious living and dining area, walk-in closets, full baths, air conditioning, ceiling fans, cable TV and high speed WiFi Internet access. The two private terraces of each condo offer spectacular panoramic views of Caribbean Sea and the nearby islands of St. Martin, St. Barths and St. Kitts. There is a fresh water outdoor pool on site for you to enjoy. Daily maid service is provided and the grounds of Ocean Terrace are maintained by a pool and garden attendant. There is 24-hour on-site management, private parking and a complete laundry facility on the premises. Ocean Terrace is centrally located near shopping and restaurants and only minutes from gorgeous Shoal Bay East. Make Ocean Terrace your home on Anguilla and enjoy breathtaking sunsets and sunrises on your outdoor terrace while relaxing under gentle breezes to the sounds of the surf. Let the tranquility of the unspoiled landscape, panoramic views and serene living at Ocean Terrace rejuvenate your mind, body and soul.